CO2-Recovery Plants from Dry Ice Production will provide an enormous reduction in production costs when producing dry ice. 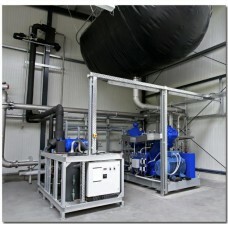 The general physical rule will apply for all types of dry ice machines when producing dry ice snow out of liquid CO2. This effect is called a physical conversion between the liquid phase of CO2 changing into dry ice snow and gas. Out of 100kg liquid CO2 only 40-45kg will be dry ice and 55-60% will be CO2-Gas which is normally lost to the atmosphere. Therefore, with the use of a CO2-Recovery Plant especially designed by CTS, the overall conversion ratio will increase up to 90-95% (out of 100kg liquid CO2 = 90-95 kg of Dry Ice). 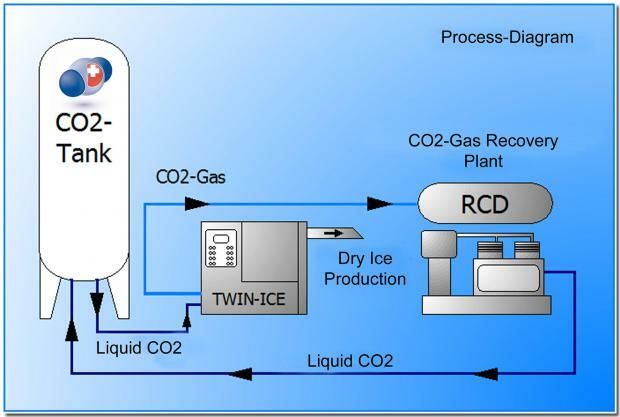 With the illustrated drawing below, we would like to simply illustrate the implementation of a CO2-Recovery Plant in your existing dry ice plant. Our design can be adjusted no matter what brands of dry ice machines you may use.